You know that wonderful smell when you walk into Williams Sonoma? I like to recreate it at home with this simple recipe. Combine lemons, rosemary, and vanilla in a saucepan. Cover with water and simmer on low. Add more water as it evaporates. Store in refrigerator overnight, and reheat for up to 3 days. 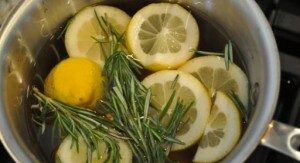 Copyright © 2012 Our Everyday Dinners - This is an easy recipe for how to make Rosemary Lemon Vanilla Home Scent.